On August 21, 2017, millions of people across the United States will see nature's most wondrous spectacle — a total eclipse of the Sun. If you want the perfect vantage point, Royal Caribbean is offering a special cruise just for you. Dubbed the, "Total Eclipse Cruise," Royal Caribbean's Oasis of the Seas will offer a 7-night Caribbean sailing, which will cruise to the optimal spot at sea for guests to witness the total solar eclipse on Aug. 21, 2017. During the sailing, the sun will be entirely covered by the moon. 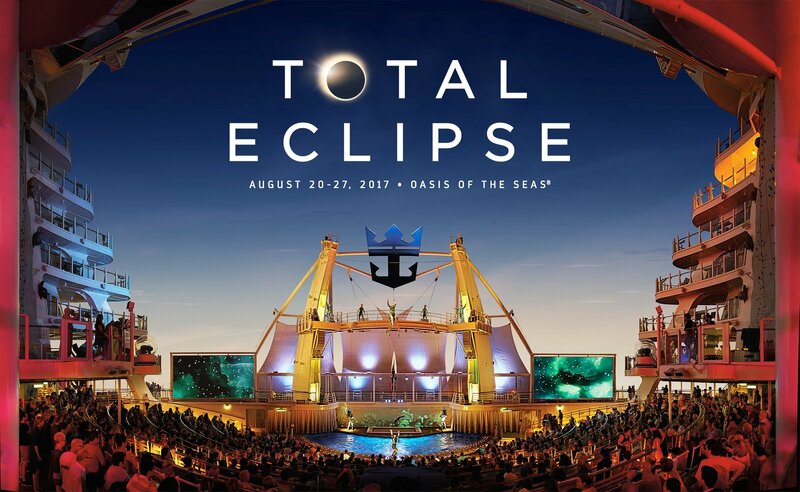 The Total Eclipse Cruise will feature a bucket-list-worthy viewing party with a live concert performed by a major headliner – to be revealed at a later date – to celebrate the celestial phenomenon that is poised to become the most photographed, most shared and most tweeted event in human history. More information can be found at RoyalCaribbean.com/TotalEclipse. Seven other Royal Caribbean ships will be in the Caribbean during the total solar eclipse on Aug. 21, on itineraries ranging from 3 to 9 nights, offering guests extraordinary partial views of the phenomenon to make for a memorable experience. The seven ships are Allure of the Seas, Anthem of the Seas, Empress of the Seas, Enchantment of the Seas, Grandeur of the Seas, Harmony of the Seas and Majesty of the Seas.